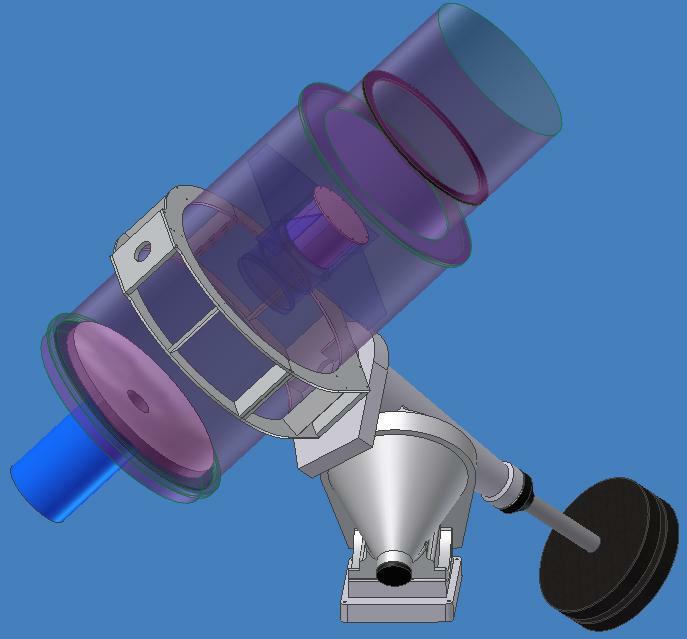 The detailed specification for the ATLAS telescope may be found here. The computer will then compile a list of all objects that appear to have changed either their positions in the sky or their brightness and will then work out which of these objects is likely to be an asteroid moving across the sky, and which may be some other astronomical phemenon such as those discussed here. If an object is suspected of being an asteroid, the computer sees if it can be identified with any of the hundreds of thousands of already-known asteroids. If not, the next step is to try to calculate the orbit of the asteroid and distinguish between a main-belt asteroid, which is no danger to us, and a Potentially Hazardous Object, (PHO) which might be. All these calculations are made within minutes of the data being taken. Go to the Impact Response page to find out what happens if we detect an asteroid on a path that may intersect with the Earth. Under favorable circumstances ATLAS can detect a 100-meter diameter asteroid at a distance of 40 million kilometers (a quarter of the distance to the Sun) and a 10-meter diameter asteroid at a distance of 4 million kilometers (10 times the distance to the Moon). If we assume the asteroid is approaching Earth at a typical speed of about 20 kph, we will get somthing like about 3 weeks warning for the 100m object and 2 days for the 10m one. As we discuss in the Impact Response page this amount of warning should be enough to move people out of dangerous areas but not to deflect the asteroid away from the Earth. Unfortunately, a large portion of the sky toward the sun – about one quarter of the night sky – is impossible to look into from the ground without seeing daylight glare and losing sensitivity. Also, parts of the southern sky are not visible from the northern hemisphere since they are below the horizon (about one quarter of the southern sky cannot be seen from Hawai'i). Moonlight also spoils ATLAS's sensitivity This leaves half of the entire sky that in principle can be seen over the course of a night from a single mid-northern latitude site. In order to assess the effect of these blind spots we undertook a computer simulation in which the Earth was threatened with a large number of fictitious dangerous asteroids. The asteroids had a range of plausible orbits, so that some were easy for ATLAS to find and some were difficult. 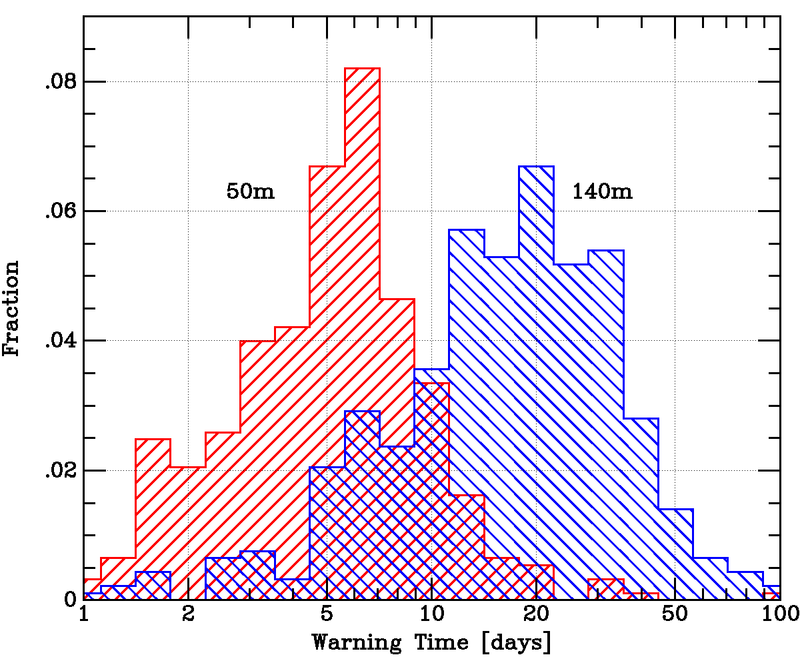 The graph shows the range of warning times that ATLAS would have provided for these asteroids. We see that most 50 m diameter asteroids will be detected between 3 and 9 days before impact, and most 140 meter asteroids will be detected 10 - 40 days before impact. As of 2019 ATLAS consists of two identical telecopes, one at Mauna Loa Observatory on Hawai'i Island, and a second on the summit of Haleakala, about 100 miles to the north-west. Having two separated telescopes doubles our survey speed and it reduces the chances of the sky being obscured by clouds. We can also get extra information about an asteroid by the parallax effect; an asteroid which is close to the Earth will appear to be in slightly different position with respect to the background stars when viewed from the two locations, providing us with additional data for calculating its orbit. There are currently plans to build two more ATLAS telescopes - one in Chile and one in South Africa, both funded by NASA.. These will allow us to detect asteroids approaching us from a southerly direction, and will also give us 24-hour night sky coverage. Multiple systems will also reduce the amount of observing time lost to cloudy weather. The new telescopes should be operational by late 2020. Several of the ATLAS scientists have alsoworked on the University of Hawai'i Pan-STARRS project, a system designed to find near-Earth objects (NEOs) moving through the Solar System long before they might strike us. Pan-STARRS is a larger telescope than ATLAS, has a larger camera, and can detect fainter objects than ATLA.. But because its field of view is narrower than that of ATLAS, it takes PanSTARRS many nights of observation to image the whole sky even once. Although Pan-STARRS can give us plenty of warning for large asteroids, it is less efficient at finding the far more numerous small asteroids that may be on course to impact Earth. ATLAS is designed to complement Pan-STARRS by monitoring "shallow but wide" sections of space. By removing the need to look all the way across the Solar System as Pan-STARRS does we can canvas the sky much more frequently. Even a small asteroid will become very bright when it makes its final approach to Earth; ATLAS will be searching for these every night, weather permitting.